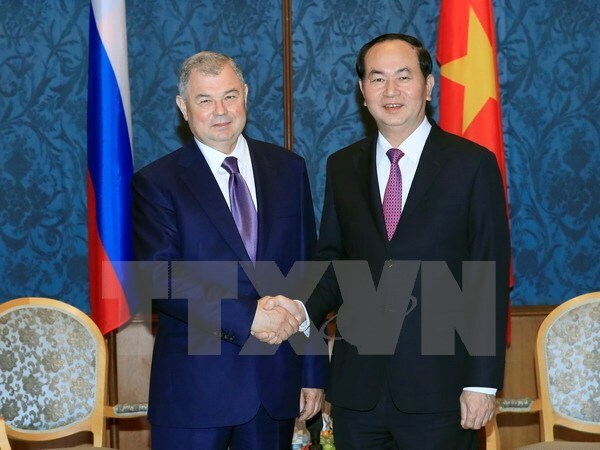 Moscow (VNA) – President Tran Dai Quang left Moscow for Saint Petersburg city on June 30, continuing activities within the framework of his official visit to Russia. Earlier, President Quang hosted a reception for Governor of Kaluga Oblast Anatoly Artamonov, in which he thanked the regional authorities for providing support for Vietnamese firms over the past years, thus helping lift two-way trade to 10 billion USD by 2020. Artamonov, for his part, said Russian people are interested in the leader’s visit because Vietnam and Russia are comprehensive strategic partners. He informed the President about the oblast’s economic development strengths and cooperation between the oblast and enterprises, including Vietnam’s TH Truemilk. The governor said Kaluga wants to form a twinning relationship with a Vietnamese locality and become a trustworthy partner of Vietnam. During a reception for leaders of the International Bank for Economic Cooperation, President Quang thanked the banks for its assistance to Vietnamese companies which have been operating in Russia. He noted that the central banks of the two countries will offer support to Vietnamese and Russian firms in each territory, contributing to fostering bilateral economic, trade and investment ties. In the morning of the same day, the President visited Zarubezhneft, one of the largest oil and gas groups in Russia.